Here are the many different strategies, tips and resources that Your Therapy Source has provided over the years all compiled in one location. 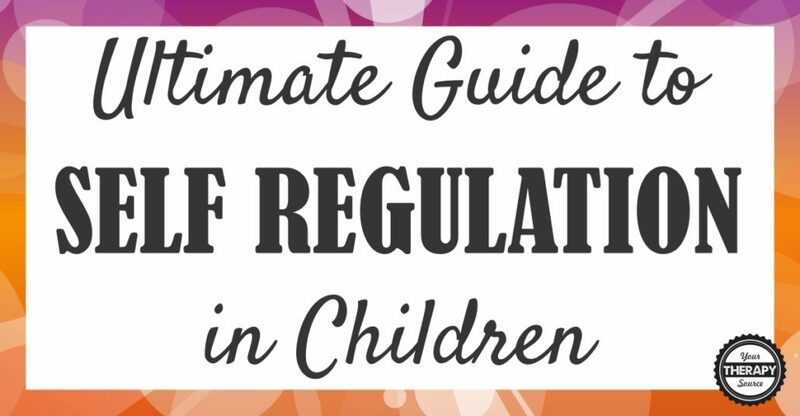 Think of it as the ultimate guide to self regulation in children. Click on each title to view the complete information on that topic. What? Why? How? 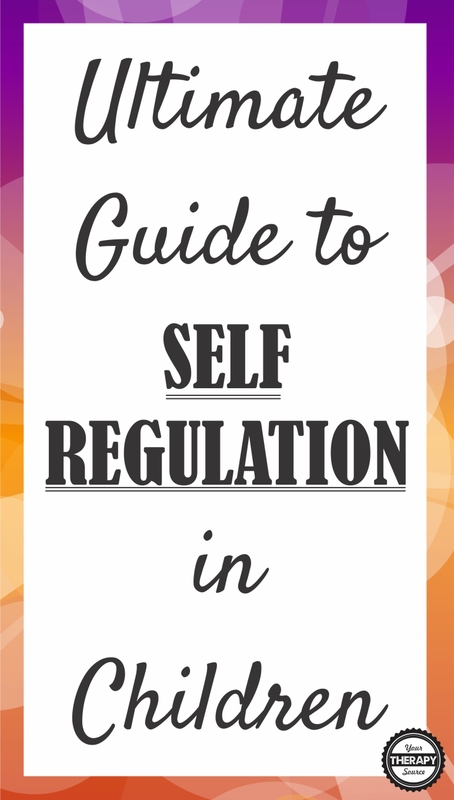 Self Regulation Skills hand out – download for free. Self Regulation Games for Children – Megan McClelland, Ph.D., Associate Professor Human Development and Family Sciences, and her student, Shauna Tominey, have allowed us to share the activities that they are working on developing to facilitate self regulation skills. Self Regulation as a Predictor of Academic Abilities – Children with higher levels of self regulation in the beginning of the school year achieved higher scores in reading, vocabulary, and math at the end of the school year. The researchers concluded that improving self regulation in children can improve academic achievement and behavioral responses. Aerobic Exercise Improved Self Regulation and Behavior – The results indicated that following the aerobic intervention phase, children experienced 32% to 51% lower odds of poor self-regulation and learning-inhibiting disciplinary time out of class. Self Regulation Skills Curriculum Move, Work, Breathe – This curriculum provides an effective, time-efficient structured system to provide classroom breaks, improve self-awareness and self advocacy and teach specific self-regulation skills so that kids have tools to use in their classrooms. This system will get kids moving, give them the benefits of a brain power boost [from getting their heart rate up], give them heavy work and isometrics to help them calm down, and help them learn techniques to quiet and control their bodies in order to return to their academic work. Self Assessment Checklist for In Class Behavior and Self Regulation – Students can refer to the checklist throughout classroom work to check in on their organizational skills, state of regulation, focus, effort, and behavior in class. Self Regulation Skills and Developmental Coordination Disorder – Read more on why children with DCD experience difficulty effectively self-regulating motor learning. Self Regulation Skills at School – Students are expected to control their actions in large group settings, small groups, transitions, independent work time, recess, the lunchroom and more. When students struggle in the area of self regulation it can result in loss of instructional time due to unacceptable behaviors. Yoga and Self Regulation for Older Students – The results indicated that the students who participated in mindful yoga demonstrated significant increases in both global and long-term self-regulation compared to the control group of students. There were no significant changes in short-term self-regulation. Self Regulation, Yoga, and Preschoolers – The assessments showed significant effects of the mindful yoga intervention on all three indices of self-regulation. Self Regulation, Cognitive Abilities, and Motor Disabilities – Students with considerable motor disabilities and mild-to-moderate cognitive disabilities showed a positive, but unrealistic, self-regulation profile. Everyday Outdoor Activities to Practice Self Regulation – The more practice children have to develop self regulation skills, the more children will be better able to think before they act. Early Predictors of Autism – Self Regulation and Sleep Patterns – A majority of the differences in communication and language, mental/cognitive function, motor function, social interaction, and self-regulation were identified at the 2-year time point. Free App to Help with Deep Breathing, Self Regulation, and Motor Planning – Here is a nice FREE app for little ones who needs some guidance with self regulation and motor planning. Self Regulation and Obesity – The children who exhibited a decrease in the ability to self regulate had the highest BMI and the most rapid weight gain. Visual Supports Schedules, Self Regulation, and Classroom Inclusion – Visual supports for self-regulation can be pivotal in implementing an IEP in the least restrictive environment. This digital download includes 283 visuals. Group Games to Help with Self Regulation – More and more research indicates that children with strong self regulation skills in preschool and kindergarten do significantly better on math, reading and vocabulary skills. In addition, children who lack self regulation exhibit excessive weight gain. Here are 3 group games to help children develop self regulation skills. These activities work great for indoor recess ideas or for a quick brain break! Physical Activity, Self Regulation and Preschoolers – Higher active play was associated with better self-regulation, which in turn was associated with higher scores on early reading and math assessments. Steps to Help Children Improve Self Control and Focus – The goal is to use the techniques that the child already has for self regulation and infuse them throughout the day to maintain self control and focus. Self Regulated Strategy Development– Self regulated strategy development (SRSD) is an instructional model to teach writing strategies to students. SRSD has been researched and shown to result in significant and meaningful improvements in writing knowledge, writing quality, writing approach, self-regulation skills, and motivation. Tips to Help Children Develop Self Control – Read 10 simple tips to help children develop self regulation skills. Mindfulness Activities for Young Children – Research indicates that mindfulness techniques in school aged children can help to improve: sense of wellbeing, ability to focus, relaxation and self regulation. There are other techniques that educators and pediatric therapists use to teach self regulation as well such as the Zones of Regulation, DIR Floortime Model, The Incredible 5 Point Scale and the Alert Program®. You can take an online course to learn the Alert Program®. If your body is like a car engine, sometimes it runs on high, sometimes it runs on low and sometimes it runs just right. When teachers, parents, or therapists use these simple words with children to begin the Alert Program®, they support self-regulation, self-esteem and self-monitoring skills. Enroll in our online training (and/or use our books, songs and games) to learn how easy it is to help children keep their engines running just right at home or school. This online training, taught by the co-authors, Mary Sue Williams and Sherry Shellenberger, offers practical, low-budget activities you can use immediately in homes, classrooms or therapy sessions. Contact Information for course: www.AlertProgramLearning.com. The Brain and Sensory Foundations course is excellent for OTs, OTAs, PTs, PTAs, SLPs, Vision Therapists, foster parents, counselors, social workers, educators, yoga and massage therapists, trauma specialists, healthcare providers and caregivers (affiliate link) – Go to the website to register. Watch a video explaining the importance of self regulation skill development in children and how you can help. strengthening and balance – Body Series: 3 Yoga/Movement Story Videos for Strength, Flexibility & Balance. self control and focus – Mind Series: Yoga Story Videos for Focus, Self-Awareness & Self-Control. self regulation skills – Adventure Skills Self Regulation Flash Cards. The best deal is on the complete bundle of 9 videos and flash cards. This can take care of your lesson planning for all year!